There was a lot to feel great about on election night, but we're very disappointed that Sen. Nathan Schlicher lost by a narrow margin to Rep. Jan Angel in the 26th District. Sometimes you don't win even when you go all in. Despite our coming up short, we're still very proud of what we did in this race. We started behind by 20 points in June – a seemingly insurmountable margin in a swing district that tilts conservative – and did everything we could to win this critical Senate seat. 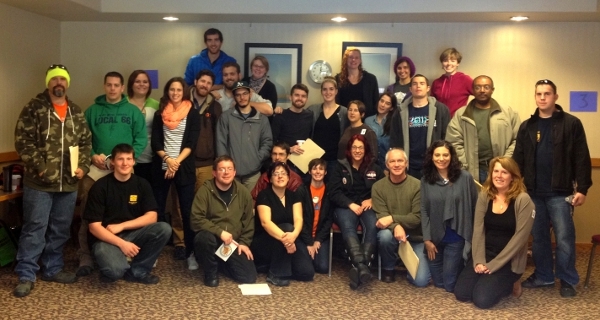 Fuse staff, volunteers, and partner organizations getting ready to canvass in the 26th District. We helped lead an incredible coalition campaign that organized hundreds of volunteers to make tens of thousands of phone calls and knock on thousands of doors. Our coalition bought television spots and online ads, and delivered persuasive mail to tens of thousands of voters. In addition, more than 3,000 people in the 26th district used the Progressive Voters Guide. While big tobacco, insurance companies, and other ALEC members spent hundreds of thousands of dollars to squeak out a win, they still have plenty to worry about. They know we aren't slowing down, we're in it for the long run, and we're determined to topple their conservative Senate majority in next year's elections. Fighting coal exports in Whatcom County: In a clean sweep and big win for climate, voters rejected Big Coal's slate of candidates in Whatcom County and instead chose four candidates to lead our families into a greener future: Carl Weimer, Rud Browne, Barry Buchanan and Ken Mann. 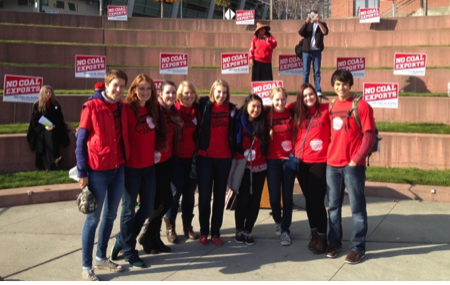 Fuse volunteers pitched in to support all four and educate voters about the proposed coal terminal and its 42 million tons of dirty fossil fuels. Winning a progressive majority in Spokane: Fuse endorsed progressives John Snyder and Candace Mumm won big for the Spokane City Council, proving that progressive values are just as critical to voters east of the Cascades. Jon Snyder won re–election handily with about 64 percent. Mumm's win at almost 54 percent helped us win back a progressive majority on the Spokane City Council. Supporting a living wage in SeaTac: Advocates for working families went head–to–head with huge international corporations and it looks like they'll win an incredibly close race. More than 6,000 airport workers will now earn $15 per hour and sick leave to take care of their families. We're optimistic this living wage movement will spread from SeaTac to Seattle and beyond in the coming years. Supporting candidates with the Progressive Voters Guide: The 2013 Progressive Voters Guide included recommendations about more than 170 candidates and measures across the state. An incredible 74 percent of progressives we recommended in the guide won on Tuesday. From the Sedro–Woolley City Council to the Mayor of Tumwater, the Progressive Voters Guide is a powerful tool to educate voters about competitive races, statewide measures, and up–and–coming candidates. Winning a progressive majority on the Bellevue City Council: Lynne Robinson emerged victorious for City Council, which ensures a progressive 4 to 3 majority on the Bellevue City Council. Steve Kasner also made an impressive showing, but unless there's a real turn around it appears likely that he will come up a few hundred votes short against Kevin Wallace, who was supported by tens of thousands of dollars of big developer money. Defending progress in Snohomish County: Fuse endorsed candidate Dave Somers received 57 percent of the vote. Members of the Fuse organizing council in Snohomish County unanimously endorsed Somers because he cares about putting families first and protecting the beautiful green spaces of Snohomish communities. Tim Eyman's Initiative 517: Voters thoroughly rejected Tim Eyman's latest initiative that would have made it easier for him to run initiatives. 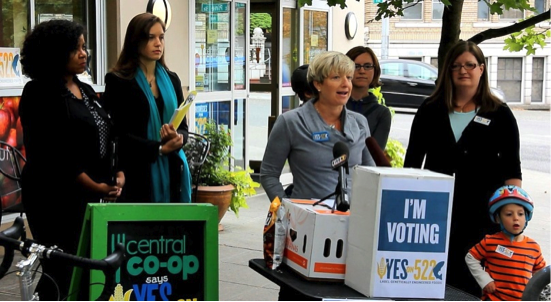 Members of Moms for Labeling took on the big food and pesticide companies opposed to I–522. Our other major disappointment on election night was I–522. We worked to expose the money–laundering scheme of Monsanto, ConAgra, and other out–of–state corporations that tried to hide more than half of the $20 million they spent opposing labeling genetically engineered food. Unfortunately, it appears that their deep pockets overcame a well–organized local campaign to label what's in our food. We're hoping Attorney General Bob Ferguson will prosecute these companies for violating our state's public disclosure laws. There were some big wins and some big disappointments on Tuesday. Throughout it all, we've been inspired by the dedication of Fuse volunteers across the state who came together to fight for a better future. To those of you that made calls, knocked on doors, shared the Progressive Voters Guide, and most of all, voted, your dedication to a progressive Washington motivates us to work even harder next year to topple Rodney Tom and the conservative Senate Majority in 2014. With you by our side, we are confident that we can. P.S. Building a foundation for progress is a long-term undertaking. Your ongoing support is critical to retaking the Senate and electing progressives next year. Nearly 200 people are part of the Fuse Powersource team who donate $10 or more every month. Click here to sign up now and help power us to victory in 2014!